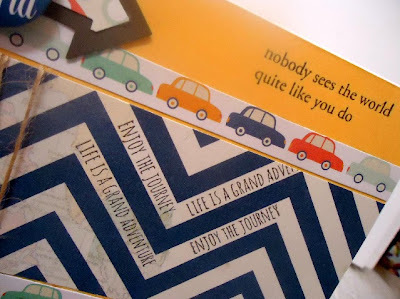 I have a fun and simple layered card today that I think would be a perfect card for that special Graduate in your life as well. 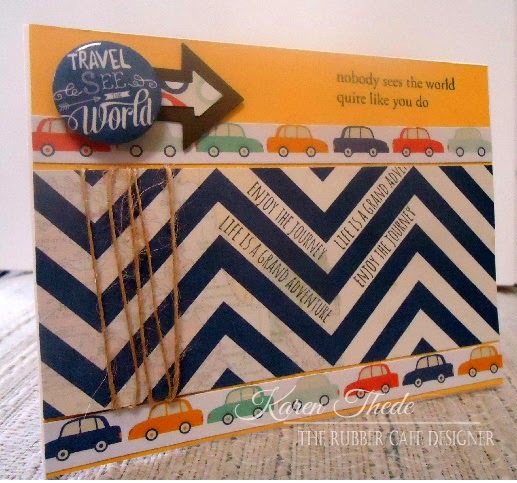 I've combined some simple stamped phrases with the patterned paper from our kit -MME -Hello World! And that piece is built on a background piece of yellow cardstock cut 4 1/4" x 5 1/2, with 2 rows of cars bordering on each side. So here's a look at my finished card, follow-along and I'll tell you how I constructed this simple card. 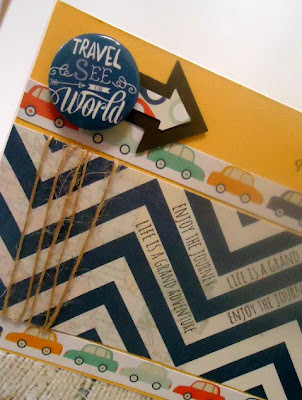 Now to the stamping part - At the top of my card on the golden yellow base layer, I stamped the phrase; 'nobody sees the world quite like you do' which fit just perfectly in the area I had left. 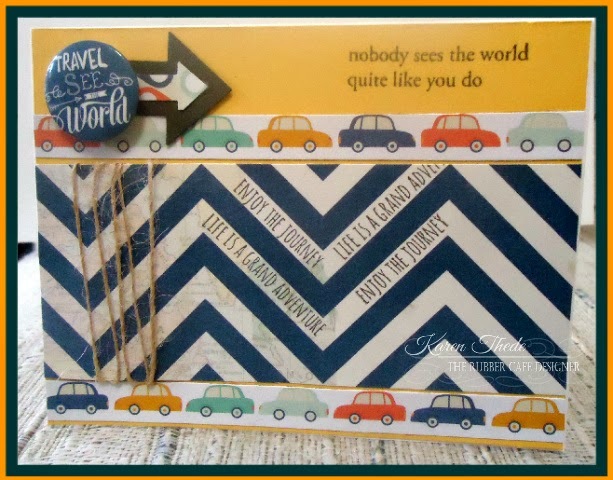 Here's a closeup - where you can see the phrases 'enjoy the journey' and 'Life is a Grand Adventure' that I stamped in between the lines using the white space of the chevron pattern of the paper, giving a sense of motion. To finish I embellished the upper LH corner, with a punched layered arrows, and one of the buttons from the kit, Travel and see the World. I also wrapped some twine from the kit around the left had side of the card. Here's one more look at my card - I think it could easily be used for a Graduation card or Retirement or just because!